The Stella King Bedroom Group by Avalon Furniture at Simply Home by Lindy's in the Hickory, Morganton, Lenoir area. Product availability may vary. Contact us for the most current availability on this product. Traditional shapes define this stately and sophisticated bedroom set. 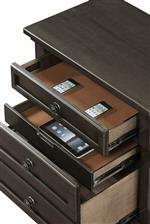 Convenience features like USB charging ports and hidden jewelry trays eliminate daily hassles, making it that much easier to love your furniture. This collection is a timeless classic that can add rich depth and undeniable beauty to any space. The Stella collection is a great option if you are looking for Traditional furniture in the Hickory, Morganton, Lenoir area. Browse other items in the Stella collection from Simply Home by Lindy's in the Hickory, Morganton, Lenoir area.